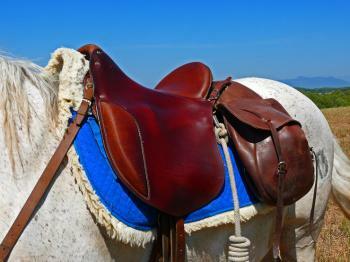 On horseback in Catalonia along the "Wild Coast", you will find perfect sandy beaches, picturesque bays and intriguing mountains that will fulfill dreams of exploring the Spanish countryside as we bring friends together over fantastic local wines and delicious Catalan cuisine! 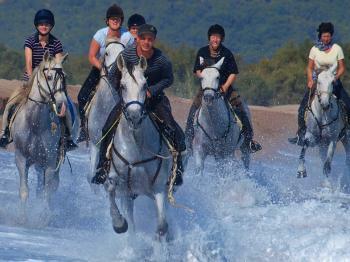 When we are not cantering on stunning stretches of beach and climbing the mountainside for the best possible views, riders will be introduced to the local wine cellars for wine and cava sampling, stay at rural but luxurious guesthouse and hotel accommodations and be served the best regional cuisine available along this exciting and adventurous trail! A fun and fascinating exploration of the Mediterranean coast that will take you through quiet olive vineyards, lovely wine estates, bright sunflower fields, ancient medieval villages, the Bay of Roses, the 16th C farmstead of Mas Alba. The spectacular geological outcrops here are one of the most significant features - intricate and beautiful, they can vividly stir one's imagination! Created by the wind and sea, the shaping of the rocky peninsula that began thousands of years ago and it continues into present day, has created the imagery of mythical lions, dragons, camels, eagles and cats. - Delicious tasting of wine and cava! - Visit to the medieval village of Perelada! Rates include*: Accommodations (5-6 nights in dbl room with private bath and 1-2 nights with shared bath), most meals (arrival day dinner and departure day breakfast, 4 days fullboard including wine, 1 day halfboard (dinner at restaurant not included), 1 day breakfast only), 6 riding days, tax on tourist establishments, transportation of luggage, local transfers during trip. Single rooms cannot always be guaranteed. If a previously confirmed single room is not available, the guest is entitled to a refund of the price paid for those nights surcharge. Transfers only payable in cash. Arrival at Barcelona or Girona and transfer to a beautifully situated country hotel, a typical Catalonian house built of natural stone. It dates back to the 17th century, and it is surrounded by woods as well as walnut tree and olive groves. The location in this idyllic area where silence and tranquillity prevail makes this guest house the ideal place to enjoy nature and to relax. The lovingly designed garden, the pool, the meadows, and forests provide a wonderful atmosphere. What a place to start your horse riding holiday! Dinner around 9:00pm. A delicious breakfast is followed by a short transfer to our horse farm Mas Alba where we meet our proud Spanish four-legged partners. We saddle the horses and start our first riding day that leads us through thick stone oak and pine forests towards the river Fluvia. Sunrays break through the deep green of the seemingly tropical jungle. Bamboo trees border the path, and high up creepers and vines grow around the trees. We are in Spain, but the atmosphere reminds of Costa Rica. Lonely paths are winding through the full-green flood plains along the river. A pleasant tranquillity surrounds us. Only when we ride through the Catalonian natural stone villages the hooves of our horses echo through the narrow streets and alleys. At a lake, we regain our strength by a tasty picnic. Later in the afternoon, we canter towards the coast. The stud owns more than 30 brood mares and excellent stallions, some with a significant impact on the breeding of the Pura Raza Española. The horses, that are bred here, are not only characterized by their beauty, but also by their outstanding attitude and rideability. In this wonderful atmosphere, we are spoilt with delicious paella with seafood and fresh vegetables in the evening. Crossing grazing land, we ride speedily and pass fields of vines and sunflowers on our way to Perelada. Full of new energy, we ride along laboriously built-up stone terraces, and ancient olive trees line the path. Numerous colorful flowers grow in the flood plains of Orlina. Mystically raising round rock formations and Celtic tombs from pre-Christian times remind us of a great past. The lowlands of the Ampurdán resemble an amphitheater surrounded by mountains, whose exit is at the Gulf of Roses. Subject to changes : depending on the season, the weather, national holidays and the number of trails running, we may make alterations to itineraries at short-notice. Trails can also be ridden in both directions. Interested in a city tour with a local on your arrival or before coming back? Our partners "Urban Adventures" offer half day or full day city tours with a difference! In just a few hours they get under the skin of the city you're visiting - so you know it like a local! Hidden Trails clients get a 10% Discount off all city tours, just use the promo code "HIDDENTRAILS" when booking your tour. Please book direct with "Urban Adventures". Pace: Moderate tempo. Beach riding is a bit more advanced and descend into coastal mountains. 3-5 hours in the saddle per day. This is a progressive ride, so nights will be spent in different locations. You will be staying in 6 locations total. Most meals are included in the tour (arrival day dinner and departure day breakfast, 4 days full board including wine, 1 day half-board (dinner at restaurant not included), 1 day breakfast only). Wine is included with some meals. Three lunches or dinners are not included in the base pricing since we will be eating at local restaurants. This fee needs to be paid locally at your first dinner. Please note we only accept Euros!